Beyond this, even if Mutlak can perhaps be accused of wavering rather often when it comes to his relations to Maliki, the disputed areas of northern Iraq and the contest between the central government and the KRG have generally speaking been among the few issues where Maliki has been able to win some Sunni and secular friends during his two terms in office. By way of example, after parts of Iraqiyya opted to boycott parliament and cabinet following the arrest order for Vice President Tareq al-Hashemi in December 2011, it was mainly deputies from Kirkuk and other northern areas unhappy with the pro-Kurdish turn of Iraqiyya that defected and signalled their willingness to work with Maliki through breakaway factions like Free Iraqiyya and Wataniyun. Similarly, Arabs from the disputed areas have repeatedly played a certain role in helping Maliki defeat pro-federal tendencies in the northern governorates. It will not be possible for Maliki to alienate both the Kurds and the Arabs of the disputed areas at one time. In a reflection of this dilemma, Maliki has reportedly rejected the resignation of the education minister from the Mutlak bloc, and is still weighing his options with regard to Kurdish ministers he had promised to replace by acting ministers in the case of prolonged absence from cabinet. 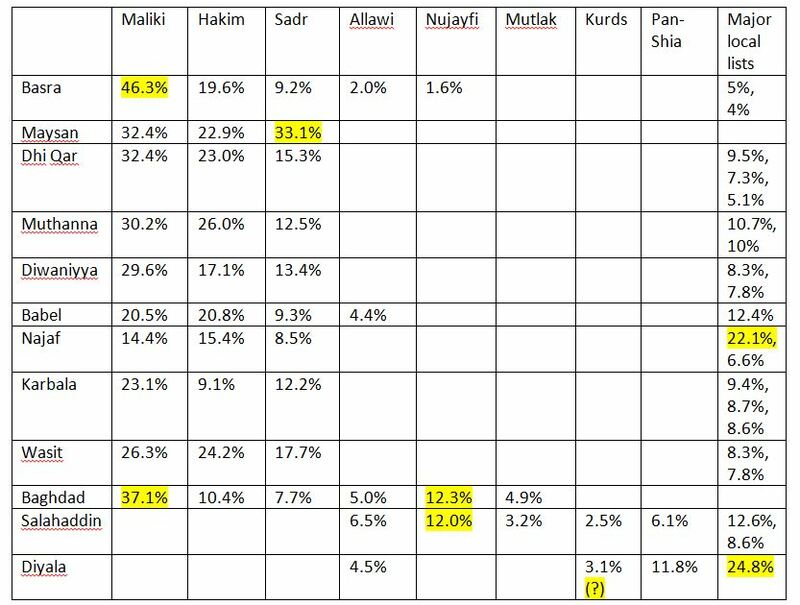 One interesting indicator of how this tug of war will play out relates to the provincial elections results of Diyala and Salahaddin, which have Sunni Arab majorities and significant Shiite and Kurdish minorities. Those results, expected later this week, will likely influence the extent to which factions like that of Mutlak will remain in protest mode. Another significant process is the holding of delayed elections in Anbar and Nineveh. It emerged yesterday that there has in fact been considerable tension between the elections commission IHEC and the Iraqi cabinet on the issue: Whereas IHEC indicated 18 May as the latest possible date, the Iraqi cabinet decided that elections will be held on 4 July absent any radical improvement of the security environment at an earlier stage. The relevant legal framework gives cabinet the right to fix election dates on the recommendation from IHEC; to what extent this procedure has actually been followed now seems in doubt. It is no more possible for Maliki to endlessly delay elections in Anbar and Nineveh than to pretend that the conflict in neighbouring Syria doesn’t exist. Maybe the Hawija incident can serve as a reminder for Maliki about how radical winds from Syria can easily derail Iraqi politics, and how critical it is for him, now more than ever, to build bridges and create accommodation rather than letting confrontational politics of the Syrian kind gain hold in Iraq. And these are not the only problems. Maliki was recently summoned to parliament to be held accountable for the latest spate of serious security incidents; he responded by excusing himself, insisting he was too busy running the affairs of the state to indulge in conversation with the Iraqi national assembly. Similarly, in another move unlikely to inspire confidence in the security situation in the country, local elections scheduled for 20 April were postponed, probably in an illegal way, in two Sunni-dominated provinces bordering on Syria. Look closer at some of the stories dominating Iraqi political news and a similar picture of a democracy that is just muddling through emerges. For example, in an interesting move, Qutayba al-Jibburi – a deputy who broke away from the secular and Sunni-dominated Iraqiyya to pursue dialogue with Maliki in 2012 – recently reported the full reinstatement of de-Baathified workers at the Bayji refinery thanks to his own personal efforts. Whereas the announcement was a positive indication that dialogue between Maliki and secular and Sunni leaders still remains possible, it was also a reminder about the extent to which processes that are supposed to be judicial are subject to political pressures and horsetrading in the “new, democratic Iraq”. Similarly, this week, the Iraqi cabinet agreed on proposed revisions to the de-Baathification law, which in theory could provide a more enduring framework for national reconciliation. But the law, agreed by a cabinet full of acting ministers and with key blocs not represented, remains hostage to parliamentary approval. For the moment, the main problem in parliament is to get deputies to actually attend, with a series of cancelled meetings recently due to a lack of quorum. What are we supposed to make of this? Factions that squabble but ultimately muddle through? Or just the same authoritarian politics of the past, with a higher number of Saddams in control? The answer is, that question is still not settled. It is impossible to paint a truthful picture of Iraq today in black and white. Perhaps the best way of illustrating this is to look at the latest developments regarding the cabinet proposals of changes to Iraq’s de-Baathification legislation. The reported changes to the existing bill from 2008, if adopted by parliament, would mean a somewhat more liberal approach to the question of what to do with high officials of the Saddam Hussein regime. Specifically, it is being proposed that former Baath party members of the firqa level – who have hitherto been considered disqualified for continued state service if they held positions as director generals or worked in the security, finance or foreign ministries – will be able to continue to serve in government. The political background for this somewhat more permissive arrangement for ex-Baathists is rapprochement between Prime Minister Nuri al-Maliki and parts of the secular and Sunni-dominated Iraqiyya headed by Saleh al-Mutlak. Whereas much of Iraqiyya has been boycotting both parliament and cabinet lately in protest against what they see as undue centralisation of power by Maliki, Mutlak has opted to return to cabinet alongside a few other ministers who disagree with the hardline stances of Iraqiyya leader Ayyad Allawi as well as Rafi al-Eisawi and Tareq al-Hashemi. It is important to stress that a softening of the de-Baathification legislation is not something that uniquely benefits Sunnis or other secular Iraqiyya supporters. Maliki has himself relied on large numbers of Shiites who served Saddam, and the fact that their pasts were often brushed under the carpet created a major inconsistency in the way de-Baathification was applied. By way of example, embattled supreme court chief Midhat al-Mahmud is accused precisely of having been a firqa member of the Baath in Baghdad; the proposed changes of the law would make him eligible to continue to serve regardless of those accusations. The key question, then, is whether the bill will be passed by parliament. When the debate gets going, it should serve as a good opportunity for Maliki to reach out to much-needed potential supporters among Sunnis and secularists and making his constant references to a “political majority” to something more than rhetoric. Already there are interesting signs that whereas the Sadrists are attacking the bill (as are members of the Badr), Maliki allies in parliament are defending it. For their part, Iraqiyya MPs would thoroughly stultify themselves if they reject the bill (which will benefit many members of their constituencies) out of sheer personal opposition to Maliki. Accordingly, with the Kurds currently boycotting parliament and often uncommitted in de-Baathification questions, Maliki now has the chance to cast himself as a moderate after he failed to play that role when de-Baathification came on the agenda during the months leading up to parliamentary elections in March 2010. In sum, the progress in the Iraqi cabinet on the de-Baathification bill indicates an atmosphere very different from the visions of partition and regional conflagration that dominate media commentary on Iraq at the anniversary of the fall of Baghdad. Ironically, 10 years on, it seems that the pragmatic nuts and bolts of reinstating officials of the hated Baath may serve as a bridge-builder towards national unity as much as a source of conflict for Iraqis.